When some people decide to start blogging, they begin seeking useful advice online. The advice is usually pretty much the same: find a niche, think about your target audience, remember about SEO, and so on. Such rules definitely can be useful to someone, but not for all. Though blogging can be a profession, many people view it more as their hobby, as something they are passionate about. And rules aren’t always useful when it comes to passion. 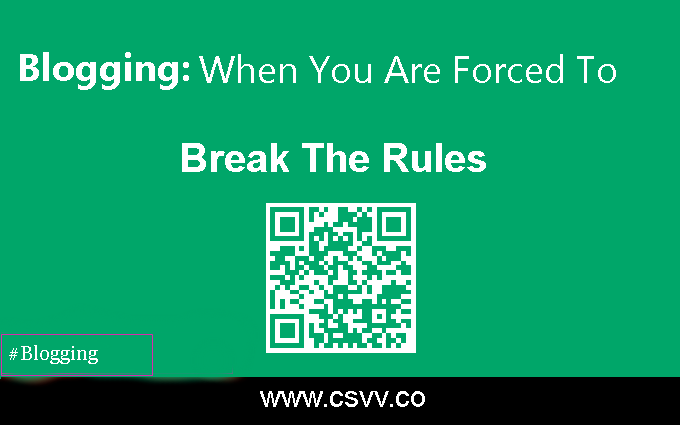 If you are a beginner blogger, you may feel uncertain about what rules to break. Don’t worry: this article is going to help you become a real blogging rebel. 1. Find your niche and your audience. These two pieces of advice are probably the most common among those given to beginner bloggers. Actually, it means that we have to limit ourselves right from the start. It’s okay if you do want to write about a certain niche or about one of your hobbies, but not all beginner bloggers are so certain. Some may even start writing about one thing only to understand later that they want to write about something else too. In this case (or in case you feel that you want to write about everything without limiting yourself at all), feel free to break this rule and don’t worry about losing your audience. While some believe that bloggers depend on their audience completely, actually they form this audience themselves. When you’re writing about things you’re passionate about, you attract people who understand you, share your interests and beliefs. That’s why you shouldn’t limit yourself: this way you’ll end up having just the right audience for you. Some bloggers are advised to write SEO-friendly posts: using catchy headlines, lists, keywords, etc. Though it does help promote your blog and improve its ranking, it often limits creativity too. It’s good if you are able to write SEO-friendly articles without struggling too much, but if the situation is different, maybe you should break this rule too. After all, there are many other more interesting ways to promote your blog without limiting your creativity and turning the whole writing process into a nightmare. 3. Monetize your blog as soon as possible. It’s true that some people start their blogs only because they intend to monetize them. However, monetizing shouldn’t be your priority, when you start blogging: high-quality posts and a loyal audience are more important. If you think about monetizing only, you will most likely have less fun and won’t be able to focus on other things that are important for your blog. Blogging is an interesting, amazing process itself, and it’s good to enjoy this process first before thinking about how to turn it into a business (of course, if you aren’t a business owner or a business blogger). Put your efforts into building a strong community: this way even monetizing will be easier later. 4. Your post should fit certain requirements. The Internet is filled with advice about writing blog posts: some advise finishing them with a question, some recommend bloggers to avoid sharing personal stories, etc. However, there’s no ideal blog post pattern. You may ask questions at the end of your post but at the same time you may write an interesting post that will provoke discussions just as it is. And, of course, you can share personal stories if you want: people usually like them. There is only one strict rule about blog posts: they have to be interesting. Of course, it’s a very unclear definition, but that’s the point. Write something that you would like to read – and others will like it too. 5. Choose a certain design. The design of a blog has to be minimalistic, a logo has to be black – that’s what some people say. But the only thing that is actually important about the design is that it shouldn’t strain the eyes. As long as you avoid eccentric color combinations, choose the right fonts and make sure that your blog is easy to read, everything will be okay. You don’t have to choose a blog design you don’t like. Your design, like everything else in your blog, has to reflect your personality. Remember that reading smart tips about blogging is good: this helps you grow as a blogger, to understand this sphere better. However, it’s up to you to choose whether you want to follow these blogging tips or not. Interesting post, to say the least. I don’t necessarily agree with most of the points raised in the article, but I respect that fact that you don’t have to follow the rules when you start blogging. You can write and do whatever you want with it. HOWEVER, if you really want to hack your blog’s growth by getting more visitors, subscribers, and potentially earn money from it, then you should refine your blog’s niche, think about SEO, etc. After all, these “rules” exist for a good reason. Thank you for your comment, Christopher! I am very pleased to hear that you enjoyed my post. Nevertheless, everyone chooses how they he will promote their blog. Moreover, if a person is a beginner, he/she does not understand many of the terms such as SEO etc. Then he/she needs to follow the minimum guidelines of blogging.